Just found some great end-user solution website, I want to share with you. There are lots of the other sources on the web. Do you want to change multiple lines of text to single line of text? When we go to list settings under section column, we find the column we want to change. Click on the column name “Company” , change it into plan text and save. 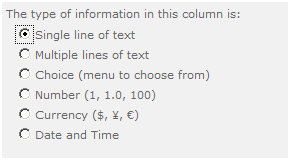 Now click the column again and this time change it to Single line of text and save. Now you have changed from “Multiple lines of text” to “Single line of text”. Are you having problem with datasheet view in SharePoint? You get following message when you choose to open a list in datasheet view? Here is the solution. Go to this link and download the “2007 Office System Driver: Data Connectivity Components and install. After installation the problem is solved.